NASA-NOAA's Suomi NPP satellite passed over the Northwestern Pacific Ocean and captured a visible image of recently formed Tropical Depression 11W. Tropical Cyclone 11W formed on July 15 and maintained strength as it moved west and approached the Philippines. On June 16 at 11 a.m. EDT (1500 UTC) the Visible Infrared Imaging Radiometer Suite (VIIRS) instrument aboard NASA-NOAA's Suomi NPP satellite captured visible image of 11W. 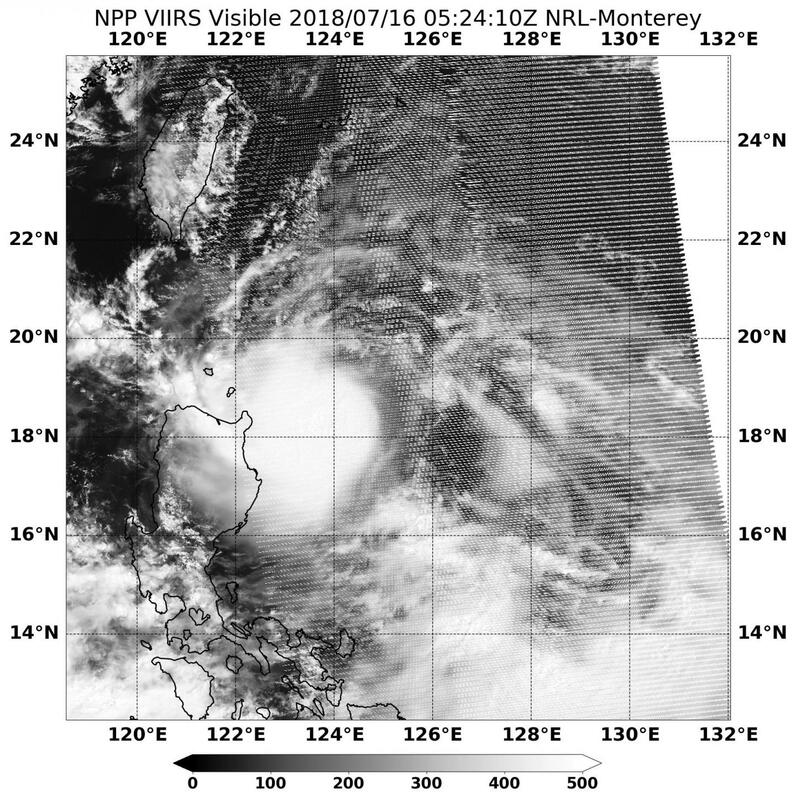 The VIIRS image showed 11W's center was located between just off the northeastern coast of Luzon, northern Philippines. VIIRS showed a powerful band of thunderstorms wrapping into the low-level center. The southwestern quadrant of 11W was over Luzon, bringing gusty winds, rough seas and heavy rainfall. On July 16 at 11 a.m. EDT (1500 UTC) 11W's center was located near 18.8 degrees north latitude and 121.2 degrees east longitude. That's approximately 255 nautical miles north-northeast of Manila, Philippines. 11W was moving to the west at 20 mph (17 knots/31.4 kph). Maximum sustained winds were near 30 mph (34.5 mph/55.5 kph). The Joint Typhoon Warning Center or JTWC forecast calls for 11W to continue moving west and enter and move through the South China Sea and cross over Hainan Island, China on July 18.